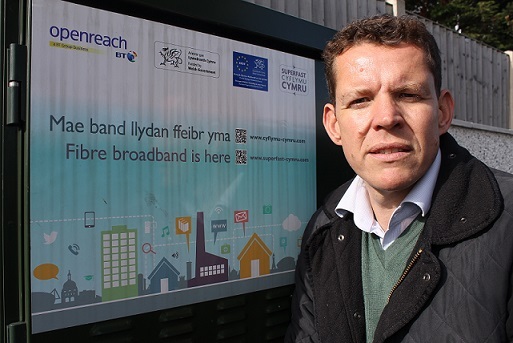 Ynys Môn Assembly Member Rhun ap Iorwerth has called for early action to ensure that ALL of Ynys Môn can achieve fast internet connection at the earliest possible opportunity. Mr ap Iorwerth recently hosted a meeting between BT and individuals and businesses currently experiencing problems with broadband speeds. BT are currently making progress on the Government-funded Superfast Cymru programme which aims to connect 96% of Welsh premises by June 2017, a year later than initially planned. He has called on Welsh Government to identify those areas that are likely to lose out under Superfast Broadband Scheme, in order that other technologies can be put in place. “It is vital that Ynys Mon is fully connected, and as technology develops through satellite, microwave, and next-generation mobile data technology, we need to realise that BT cable or fibre to the premises needn’t be the be-all-and-end-all. “For businesses and individuals it’s fast connection that’s important, not how the connection is made.